Save £8 on rrp of £19.99. Out of stock online but available in store. Other Weber accessories also reduced. 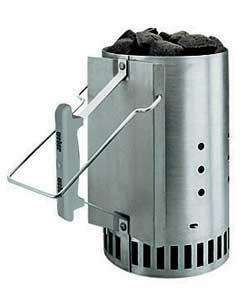 The chimney starter is a must-have accessory that ensures perfect glowing briquettes every time. It holds precisely the amount of briquettes required for barbecuing in a 57cm charcoal barbecue. The bottom grate is conical, so it makes the most of the chimney effect. Made from steel with a thermoset plastic handle. DAMN Just bought this for 16.99, oh well, dem da breaks. checked 20+ stores in the SE and no stock so far. A bit of a pointless deal if none of the stores have stock. Yeah I can, but the chimney saves messing about with fire lighters or fluid, and they're pretty quick at getting the briquettes hot and distributed more equally. Brilliant, thanks op reserved myself one to go with my new BBQ I got a few weeks ago! I've had one for about 3 years now and they are fantastic. Just fill it up and stick a bbq lighter underneath, come back in 15 mins and done. It never fails and you don't have to keep an eye on it. Got one and I would recommend it highly. I don't use firelighters to start the coals, just a couple of pages from the local rag. Also quite good for the fire after the bbq when camping and the like. Was given one as a gift (would never have bought it for myself) - I'm a convert, it's brilliant! Hot! Nearest stock to London is Salisbury 8). Great if you can pick one up. Just picked mine up. Good quality. 3 in Nottingham Riverside. I've had one for about 3 years now and they are fantastic. Just fill it … I've had one for about 3 years now and they are fantastic. Just fill it up and stick a bbq lighter underneath, come back in 15 mins and done. It never fails and you don't have to keep an eye on it. Using a firelighter is defeating the object! Now only £5 in B&Q as posted elsewhere. Deal posting newbie! This is dickon first deal post. Help out by leaving a posting tip or just to show your appreciation for their contribution.